While messing around on the mooring and rowing back and forth, we had come to know a bunch of guys who worked at the nearby Bayview Slipway. They seemed to be nice people and we’d seen a lot of their work, so we booked Pindimara in for an antifoul, a safety check, a rig check, and a fancy new Kiwiprop feathering propeller. Mark and the lads did a good job of that, so we booked them again to put in our self steering system, which had finally arrived from England where it had been on order at the Hydrovane factory. The job of fitting it was physically simple but the unit was very heavy and clumsy to move around, so we thought that we’d let the professionals figure out where to drill the holes. At the same time, we asked them to fabricate a mounting for the tow generator, and they decided to move us to a marina berth so that they could get better access. We took advantage of the easy access and mains power to finish up all those little jobs that needed doing; installing a fan in the saloon, fixing a dodgy burner on the stove, installing an LED spotlight in the galley, cleaning the coral off the log sender, and replacing the old sponge mattresses in the forepeak with custom-made latex. A couple of weeks and quite a few thousand dollars later, all the mounts were in place and I fitted the actual Hydrovane unit, which looked quite spectacular and got a lot of admiring looks from passersby. 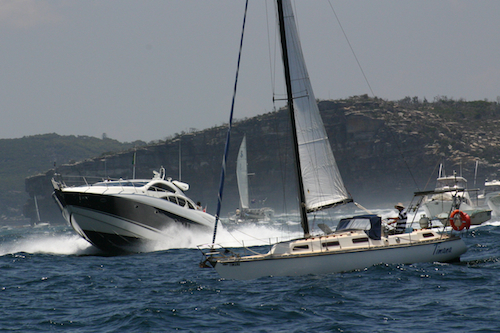 It was the christmas holiday season and the annual Sydney to Hobart sailing race was about to start, so we killed two birds with one stone by doing sea trials in the direction of Sydney heads on the day of the race. There wasn’t any wind on the way down, so we had to motor for most of the way, which meant that we couldn’t test out the Hydrovane self steering or indeed our new rigging. However, there was nothing to stop us from running the tow generator, so when we got into deep enough water I rather carefully tied the twenty or so metres of line to the heavy propeller (a fisherman’s bend at both ends, whipped, it said in the instructions) and with some trepidation plonked it overboard. Its a really heavy unit and the Ampair instruction manual is full of dire warnings about porpoising propellers and twisted lines, but in the event the whole system was very calm and gentle and quietly got about the business of making electricity. A few hours later we were approaching Sydney heads, and a bit of a breeze sprang up so we put up the sails and stuck our nose in to see what was happening. The race proper starts from the harbour, which isn’t really visible from the heads, and we didn’t want to go all the way in because we knew that it would be crazily crowded. Even out here, there was a fair bit of activity, and a great many yellow buoys that seemed to be race-related. We hove to and fired up the internet to see what it had to say on the race site. Apparently there was a no-sail zone anywhere inside the harbour, and a no-go zone inside the buoys, and a no-wake zone during the start, which was not due for another few hours. We decided that since the wind was now nice and steady, we’d sail out to sea and test out our gear, and then heave to just outside the heads and watch the race boats come out. The Hydrovane wind-vane self-steering was a dream. It took us perhaps fifteen minutes to understand what it was trying to do, and then we were in love. The unit consists of a bright red sail sticking up at the stern, connected by a simple and very strong gearbox to its own rudder, completely separate from all the boat’s own systems. 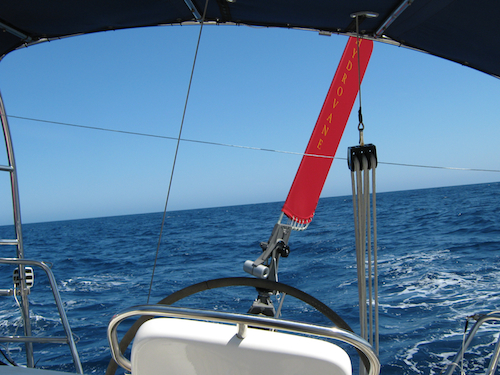 In use, you first get the yacht’s own sails and rudder set the way you want them, so that the boat is moving sweetly through the water in the direction that you want to go. Then you lock the steering and forget about it. Now you align the Hydrovane’s sail with the yacht’s, and put it into gear by pulling a simple knob. From now on, whenever the wind shifts, the Hydrovane sail flops to one side and its rudder automatically compensates to bring the yacht back on track. This means that far from following a set course, it follows the wind through every gust and lull, ensuring that the sails remain correctly set for your chosen angle of sail. There is some minor tuning that you can do, but basically it just does the job without attention, powered entirely by the wind. What this means is that when you are alone on watch, the boat can steer itself, freeing you up to do other things on deck, and releasing you from the very tiring task of continually watching the wind and steering into the gusts and out of the lulls, or continually losing power as you steer up and down the swells. We were also impressed by our sail rig. We’d had all new halyards made up, and had asked the rigger (Mario Ruel at Bayview Slipway; he’s brilliant) to change our single-line reefing, which originally controlled the first and second reefs, to now control the second and our newly installed third reef. We had found that we never bothered with the first reef anyway, going straight to the second when it gets windy, and if we really need it one day then its pretty easy to tie it down manually as its not far from the deck. In addition to this, we were using our new cruising jib foresail for the first time in anger, and it was everything that the sailmaker (John Herrick in Nelson Bay; he’s brilliant too) had promised. The Bavaria originally came equipped with a huge genoa which was just far too overpowered and gave us stacks of weather helm (which makes a boat hard work to steer). This new little jib kept the boat beautifully balanced so that you could steer with one finger, and because it had a nice high clew we could see under it as well. 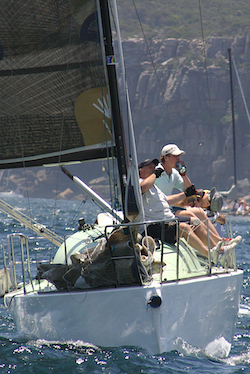 Very chuffed with ourselves, we sailed back to Sydney heads and hove to to wait for the start of the race. All was quiet and serene. The sea was calm and smooth, with only just enough wind to keep the few yachts hove to. A square-rigger drifted gently back and forth, packed to the scuppers with tourists. We couldn’t see around the corner into the main harbour, but the start time was approaching and we could hear the radio chatter as the race boats jockeyed for their start positions, and a foreign freighter captain berating a pleasure boat in his path. There was a period of radio silence and then a quick countdown. Then, for quite a few minutes, nothing. All of a sudden, the sky was full of helicopters. 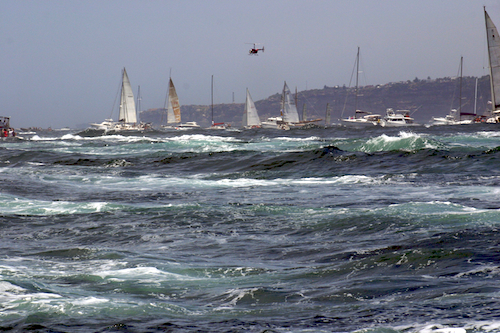 Then, seconds later, the whole bay erupted with hundreds of power boats going full bore. It was complete chaos; boats were screaming out in every direction, heavily overloaded with families and friends and beer and cameras. The calm sea was instantly transformed into several metres of criss-crossing swell. Water sprayed over the deck and into the cockpit as an enormous Sunseeker swamped us in its wake. What happened to our nice quiet harbour? We held on to strong points and looked in vain for the race boats, and then suddenly there they were, hugging the southerly head and shaking out their spinnakers. They were almost invisible in a churning mass of power boats, tinnies, fishing boats, pleasure yachts, and even kayaks. With the spectators all around and helicopters buzzing at the mast head, it was a wonder that they could find any wind at all, let alone jockey for position around the final buoy. Er. Boys. Theres a big yacht here in front of you. Boys? It was mad, it was crazy, it was wonderful, and we’d never seen anything remotely like it. And then, as quickly as they’d come, they were gone; racers, newshounds and hangers-on, all had disappeared over the horizon toward Hobart. Bemused and happy after a successful and unexpectedly exciting day, we pointed Pindimara in the opposite direction and headed for home. This entry was posted in Australia, Oceania, Travel, Voyage of Pindimara and tagged Sail, Sydney on 2008/09/24 by Reinhard.